Parking Lot Maintenance Extends The Life Of Your Parking Lot. Parking lot maintenance begins with a proper inspection of your lot to determine the best course of action for your pavement’s future. 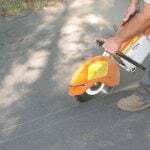 Asphalt repair is the most cost-effective and important thing you can do to protect your asphalt investment and preserve its overall lifespan. Regular parking lot maintenance should be budgeted for and is key in preserving this investment, but also in ensuring safety, aesthetic appeal, and efficient traffic flow. Your parking lot maintenance list should include asphalt repairs like, pothole repair, crack filling, asphalt sealer, curb repair and keeping a clean lot. If maintained and cared for properly, your asphalt surface should last 15-30 years. If left untreated and unmaintained, expect this lifespan to decrease significantly. Not filling cracks in your pavement is the number one reason why pavement surfaces deteriorate prematurely. Leaving cracks untreated leads to water entering into your asphalt structure. Water is the most damaging element to asphalt, and because of this, water entering its structure leads to bigger cracks, and bigger damages. If water reaches asphalt’s base, the entire structural integrity of your asphalt will be compromised and may lead to replacement. Find out how to tell if your asphalt need repairs or replacement HERE. By regularly practicing parking lot maintenance, you can preserve the integrity of your asphalt and its base, ensuring your get the entire life out of your investment. What is your parking lot’s purpose? What is the functionality needed within your lot? What will be the most effective traffic flow? 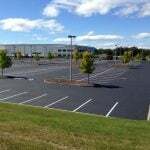 Parking lot repair and maintenance is particularly important in fall, prior to winter. Winter can be extremely damaging to your asphalt, especially if repairs do not occur before winter hits. Get your full fall checklist HERE. Most paving companies close up shop for the winter and winter paving is not ideal, but there are some temporary winter repairs you should be implementing to help preserve your asphalt until you can implement a more permanent fix come spring. Cold Patching – This is filling a pothole in winter with gravel/asphalt material without heating it. This method is cheap, and quick, and can help to decrease further damages to get you through winter. But, it is only temporary, and a more permanent pothole patching method will need to be completed when the weather warms. Read more on the difference between cold patch and hot mix asphalt HERE. EastCoat’s parking lot maintenance services include annual upkeep, repair, and crack sealing, as well as 5-10 year maintenance components like parking lot sealing. 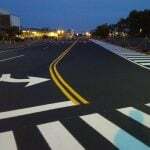 We specialize in commercial paving services, and can assist in putting into place the best preventative parking lot maintenance plans that include a parking lot paint schedule for your parking lot line painting, the best time to be sealing a parking lot, what time is best for paving a parking lot, and crack filling and asphalt services. Parking lot services and maintenance are key in extending the overall lifespan of your pavement. 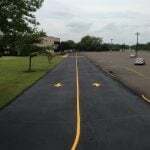 Your final parking lot construction cost may be much higher if regular maintenance is not practiced because crack filling, asphalt patching, and other parking lot asphalt repairs help to prevent larger, more costly damages from occurring.